NO PURCHASE NECESSARY. THIS CONTEST IS SUBJECT TO ALL APPLICABLE FEDERAL, PROVINCIAL AND MUNICIPAL LAWS AND REGULATIONS AND IS VOID WHERE PROHIBITED BY LAW. PARTICIPATION IN THIS CONTEST CONSTITUTES FULL AND UNCONDITIONAL AGREEMENT WITH AND ACCEPTANCE OF THESE OFFICIAL RULES. 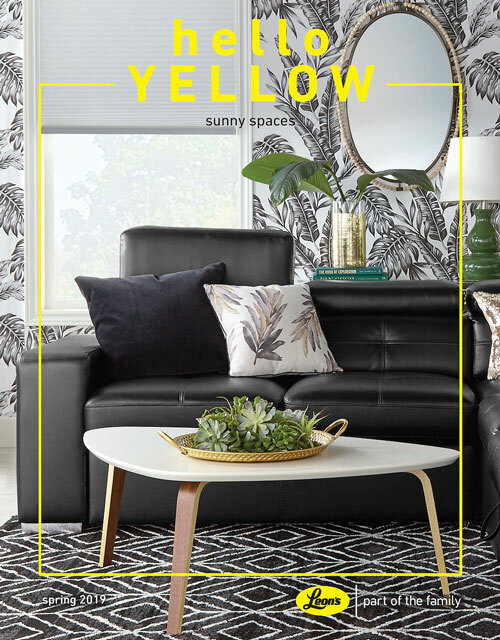 The Leon’s & Text YELLOW contest (“Contest”) is sponsored by Leon’s Furniture Limited, referred to as “Sponsor”). The Contest ends at 11:59 PM ET on June 28, 2019. (“Contest Period”). The contest is open to legal residents of Canada, except residents of Quebec, over the age of majority in the province or territory in which he/she resides. Only one entry per household will be accepted. Employees of Leon’s and their spouses, parents, siblings, children and persons domiciled with an employee of Leon’s are ineligible to enter. There is one (1) way to enter the Contest: Text YELLOW to 53677. Failure to complete all fields of the required entry form will render such entry void. If, at any time during the Contest Period and prior to awarding any Prize, the Sponsor discovers that an entrant has attempted to register for this Contest other than in accordance with Rule 2, that entrant may be disqualified from the Contest at the sole discretion of the Sponsor. The Sponsor reserves the right, in its sole discretion, to require proof of identity and/or eligibility (in a form acceptable to the Sponsor – including, without limitation, government issued photo identification): (i) for the purposes of verifying an entrant’s eligibility to participate in this Contest; (ii) for the purposes of verifying the eligibility and/or legitimacy of an entry entered (or purportedly entered) for the purposes of this Contest; and/or (iii) for any other reason the Sponsor deems necessary, in its sole discretion, for the purposes of administering this Contest in accordance with these Rules. Failure to provide such proof to the satisfaction of the Sponsor in a timely manner may result in disqualification of the entrant, in the sole discretion of the Sponsor. A $2,000 gift certificate (the “Prize”). The approximate retail value (“ARV”) of the Prize is $2,000. A Winner is not entitled to any difference between the actual retail value of any Prize and the approximate retail value of that Prize as stated herein. Odds of winning the Prize are dependent on the number of eligible entries received during the Contest Period. Only the items listed above as a Prize are provided under this Contest as a Prize. Any and all incidental costs and expenses associated with any Prize, or use of any Prize, that are not specifically referred to herein as being included in such Prize, including, but not limited to, installation of any Prize, expenses, operational fees and maintenance, shall be the sole responsibility of the Prize’s Winner. The Winner must follow all directions of the Sponsor or its authorized representative with respect to a Prize they are selected for, or any aspect thereof. Failure to do so may result in termination of participation, or continued participation, in the Prize or any aspect thereof. The Prize, as outlined above, must be accepted as awarded, without substitution, and is not transferrable, refundable, for resale or, where applicable, convertible to cash or other tender. THE SPONSOR RESERVE THE RIGHT, AT ITS SOLE DISCRETION, IN THE EVENT THAT A PRIZE, OR ANY COMPONENT OF A PRIZE, CANNOT BE AWARDED AS DESCRIBED HEREIN FOR ANY REASON RELATING TO CONTEST SPONSOR (AND NOT WINNER), AT ITS SOLE DISCRETION, TO SUBSTITUTE THE SAME FOR ANOTHER PRIZE OR COMPONENT OF SIMILAR VALUE, WITHOUT NOTICE OR LIABILITY. In the event that a substitute prize (or prize component) is awarded, such prize (or prize component) must be accepted as awarded and cannot be exchanged for cash (where applicable) or otherwise. By accepting a Prize, or a substitute prize, each winner agrees to waive all recourse against Sponsor if a Prize (or substitute prize) or a component thereof does not prove satisfactory, either in whole or in part. The Prize may not be sold or transferred. The Prize is not convertible to cash. Liability for any applicable taxes (including income and withholding tax) imposed by any government, if any, on any Prize won is the sole responsibility of the winner of such Prize. A random draw from amongst all eligible entries received during the Contest Period will be conducted at the office of Leon’s (45 Gordon Mackay Road, Weston Ontario, M9N 3X3) on Wednesday, July 3, 2019. Leon’s will attempt to contact the selected entrant by email and phone number by Wednesday, July 3, 2019, 11:59 PM ET. If a winner cannot be contacted within ten (10) business days of Wednesday, July 3, 2019, he/she will be considered to have forfeited his/her Prize and the entry will be disqualified. Another entrant will be selected from the remaining eligible entries until such time as contact is made with a selected entrant, there are no more eligible entries, or there is insufficient time to award the Prize, whichever comes first. In the event that an alternate entrant is required to be selected, this same winner selection process will apply to such alternate entrant. The Sponsor will not be responsible for failed attempts to contact a selected entrant. consents to the announcement of the winner’s name and social media handle, and the use by or on behalf of Leon’s of the winner’s name, photograph, likeness, voice or statements for advertising and promotional purposes without any further compensation to the winner. The release form cannot be amended or altered in any way and must be signed and returned by a selected entrant without any changes to its terms. Any changes to the terms of the release form will result in disqualification of the selected entrant at the Sponsor’s sole discretion. All decisions regarding the Contest remain with the Sponsor. The Sponsor reserves the right, in its sole discretion, to modify, cancel, suspend and/or terminate any or all parts of the Contest for any reason. The Sponsor reserves the right, in its sole discretion, to disqualify any individual found to be in violation of these Rules. The Sponsor reserves the right to refuse an entry from a person whose eligibility is in question or who has been disqualified or is otherwise ineligible to enter. Any attempt to tamper with the entry process, interfere with these Rules, deliberately damage any website or undermine the administration, security or legitimate operation of the Contest, is a violation of criminal and civil laws, and the Sponsor reserves the right to seek damages and/or other relief (including legal fees) from all persons responsible for such acts to the fullest extent permitted by law, which may include banning or disqualifying entrants from this and future contests of the Sponsor. In its sole determination, the Sponsor may disqualify any person who acts in any manner to threaten or abuse or harass any person and to void all such person’s associated Entries. The Sponsor reserves the right, in its sole discretion, to terminate or suspend the Contest should fraud, virus, bugs, or other reasons beyond the control of the Sponsor corrupt the security, proper play or administration of the Contest. By submitting an entry into this Contest, each entrant confirms his or her understanding of and compliance with these Rules. Each entrant, and his/her representatives, heirs, next of kin or assignees and guests participating in the Prize (“Entrant’s Representatives”), hereby releases and holds the Sponsor, any employee, officer, director, representative or agent of the Sponsor (“Released Parties”) harmless from any and all liability for any injuries, loss or damage of any kind to the entrant, Entrant’s Representatives or any other person, including personal injury, death, property damage and claims based on publicity rights, defamation, invasion of privacy or anti-spam violations, resulting in whole or in part, directly or indirectly, from acceptance, possession, use or misuse of the Prize, participation in the Contest, any breach of the Rules, or in any Prize-related activity. The entrant and Entrant’s Representatives agree to fully indemnify the Released Parties from any and all claims by third parties relating to the Contest, without limitation. None of the Released Parties assumes any liability for any incorrect or inaccurate information, whether caused by website users or by any of the equipment or programming associated with or utilized in the Contest or by any technical or human error which may occur in the processing of entries, the selection of winner or for any printing or other errors in any Contest materials. The Released Parties assume no responsibility for any error, omission, tampering, interruption, deletion, defect, delay in operation or transmission, communications line failure, theft or destruction or authorized access to, or alteration of Entries. The Released Parties are not responsible for any problems, viruses or technical malfunction of any telephone network or lines, computer on-line systems, servers or providers, computer equipment, software, failure of email on account of technical problems or traffic congestion on the Internet or at any website or combination thereof, including injury or damage to an entrant’s or to any other person’s computer related to or resulting from participating or downloading materials in the Contest. None of the Released Parties assumes any liability for any personal injury or property damage or losses of any kind, including without limitation, direct, indirect, consequential, incidental or punitive damages which may be sustained to an entrant’s or any other person’s computer, television, smartphone, tablet or other equipment resulting from an entrant’s attempt to either participate in the Contest or download any information in connection with participating in the Contest or use of any website or social media platform. Without limiting the foregoing, everything on any website is provided “as is” without any warranty of any kind, either express or implied, including but not limited to, the implied warranties of merchantability, fitness for a particular purpose or non-infringement. If there is, as a result of any error, mistake or glitch, more potential winners than contemplated in these Rules, the Sponsor reserve the right to hold a random draw amongst all claimants of a prize in order to award the correct number of prizes, which is limited to one (1) for this Contest. In such an event, Sponsor will not be liable, in any respect, to any claimants of a prize for any reason whatsoever. By entering this Contest, Entrants consent to the collection and use of their personal information by Leon’s for the purposes of administering the Contest and awarding the Prize. The personal information of entrants will not be sold or used for any purpose other than in connection with this Contest without consent. By accepting a Prize, the winner thereby grants to the Released Parties the perpetual right to use their name, biographical information, image, photos and/or likeness and statements for programming, promotion, trade, commercial, advertising and publicity purposes, at any time or times, in all media now known or hereafter discovered, worldwide, including but not limited to on television, video, the World Wide Web and Internet, without notice, review or approval and without additional compensation, except where prohibited by law. The Sponsor respects your right to privacy and uses reasonable commercial efforts to comply with Canada’s Anti-Spam Law (CASL). Personal information collected from Entrants will only be used by the Contest Sponsor to administer the Contest and, only if consent is actively given at the time of entry, to provide entrants with information regarding upcoming promotions and/or events from the Sponsor. Individuals opting to receive further commercial electronic messages can withdraw their consent at any time in the future. Individuals seeking to remove consent can do so contacting Sponsor or by clicking the unsubscribe link in email communications. The Contest is subject to all applicable federal, provincial and local laws and is void where prohibited by law. If any provision of these Rules is found by any court of competent jurisdiction to be unenforceable, all other provisions will remain in full force and effect. The Contest shall be governed by the laws of the Province of Ontario and the federal laws of Canada applicable therein. Without limiting the generality of the foregoing, all issues and questions concerning the construction, validity, interpretation and enforceability of these Rules or the rights and obligations as between any person and/or entrant and the Sponsor in connection with the Contest shall be governed by and construed and interpreted in accordance with the internal laws of the Province of Ontario, Canada, including the procedural provisions of those laws, without giving effect to any choice of law or conflict of law rules or provisions that would cause the application of any other jurisdiction’s laws. The Sponsor and all entrants hereby attorn to the jurisdiction of the courts of that Province, sitting in the City of Toronto, Ontario, in respect of the determination of any matter, issue or dispute arising under or in respect of these Rules and/or the Contest and agree that any such determination shall be brought solely and exclusively before such courts.